“Forward!” Pastel and gouache on prepared watercolor paper; 18″ x 22″; January 2014. I’ve been working on this painting for a long time; first tried it in oils and could never get the face right, so I finally gave up and started over in pastel. 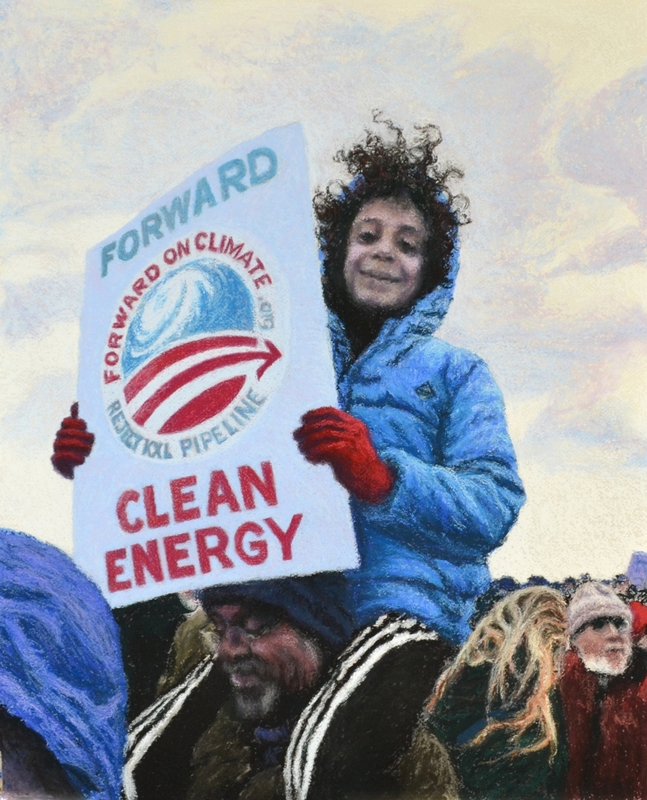 It’s from a photo I took at the Climate Rally on the National Mall last year. I really loved the photo… for months, it brought a lump to my throat whenever I looked at it, because the child’s face was even more radiant than I have drawn it… just luminous with the happiness of being there, in that moment. But it was just a cellphone photo… not really good enough to send out into the world. So I had to try to make a painting of it. I didn’t even notice the man’s expression, till later. And I thought of what an unforgettable memory they will both have, of that day. They both were so beautiful… they gave me hope! This entry was posted in Uncategorized on February 6, 2014 by allanm051.